It’s the Appliance Hunter here again, this time I’ve been looking for the best lightweight vacuums available here in the UK. Some vacuum cleaners are obscenely heavy, and I know for a lot of people this can be a real problem. But you don’t want to sacrifice cleaning power just because you need something lighter so I’ve found the absolute best one’s available. Check out the table below for a summary and just click the button to buy yours on Amazon. Obviously having a lightweight vacuum is more advantageous to having a really heavy one. But, the reasons for wanting it to be light varies. Elderly buyers love that they can maintain their independence due to the fact that they can still clean their own home. People with disabilities or back injuries also get a massive benefit from the fact that there are some high-quality lightweight vacuums out there. Even able-bodied people that are not interested in using their vacuum to replace a personal trainer appreciate that it is much less effort to use a lightweight vacuum. The benefits are fairly obvious that lighter is better. Seeing as how the vacuum is lightweight, that usually means it has a low profile. This means that storing your vacuum in an easy to access spot is easier to do than with a big, clunky machine. And that usually means you will be more likely to get the cleaning done. A lightweight vacuum can be hung from behind a door, in a cabinet or anywhere else in arm’s reach. They take up less space and are also easier to pick up and go. This isn’t true across the board, but generally speaking, a lightweight vacuum has a smaller motor that is not as noisy as it’s full sized counterparts. Cordless battery operated stick vacuums are especially quiet since the motor is made differently. It’s not unusual for a typical lightweight vacuum to be under 75 dB in noise production. Of course, your mileage may vary on this point. If you need a quiet vacuum then make sure you read the specs before buying. As with the quiet feature, this is not always true, but generally, a smaller vacuum also costs less. You can get a nice price on a very good vacuum. Usually when you want a second vacuum to have for smaller jobs, you don’t have to pay what you would for a full-sized or traditional vacuum. If you have a small space, or your cleaning needs are light, there is no need to spend as much as you would for a high-end vacuum with all the most modern features. I covered what the benefits are to using a lightweight vacuum, but here are some of the must-have items. Let’s go through some cleaning scenarios so you can see what features you would need for different cleaning solutions. Lightweight vacuum cleaners are ideal for cleaning deep pile rugs. They have a more gentle suction while still able to get deep down dust from the carpet. Look for vacuums that either doen’t have a rotating brush or ones where you can swap out the floor head. 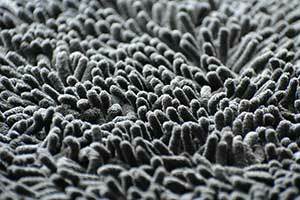 Rotating brushes can damage your deep pile rug. Same for high powered suction vacuums. Some lightweight vacuums are lacking in a good filtration system. People with deep pile carpets should look for models with good filters since there is more dust associated with thick carpets. There are many vacuums made specifically for dealing with pet hair and mess, so lightweight vacuums are no exception. 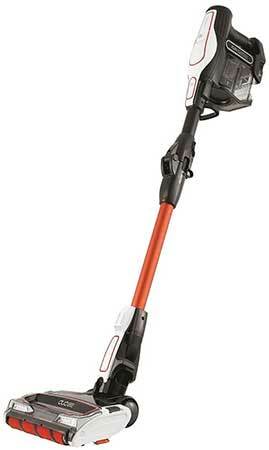 Look for a vacuum that has either a turbo brush attachment or a rotating beater brush floor head. 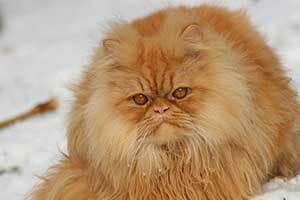 Powerful suction also helps, but the best vacuums for pet hair have those brushes to really pick up all the hair. Specialized attachments are also a good thing to have. Cleaning up after pets is a challenge so the more options your vacuum gives you, the better. When cleaning up after pets, you will likely have a lot more dust and debris going into the canister. Many lightweight vacuums have a small dustbin. Unless you don’t mind emptying the bin frequently, look for a model with a larger capacity bin. Not all lightweight vacuums are cordless so this only applies to the rechargeable vacuums. You will want to get an idea of how long it takes to give a god hovering with your current vacuum before buying a lightweight cordless model. Note the time and make sure the model you are looking into has enough battery time to properly clean your area. Take advantage of the fact that most of these lightweight vacuums are 2 in 1 models. What that means is that they can operate as a traditional vacuum or come apart to make a handheld portable vacuum. It’s not enough to just be lightweight enough to carry around if you have stairs to clean. If it can’t come apart then cleaning the stairs can be awkward. If it isn’t a 2 in 1 that can be used as a mini vacuum, then make sure it has a hose attachment to get the stairs or your car. A good lightweight vacuum that is a one trick pony won’t give you much value if it can only excel at one function. If you need a vacuum to be used to clean up something like your car, boat or cabin, then there are a few things to look for that will make it easier. As I just mentioned, a vacuum that can be used as a traditional or handheld vacuum is the best way to go in general. When you’re looking to clean up somewhere besides your flat, then having it become a convertible vacuum is essential. If your vacuum can be turned into a handheld with the touch of a button then you can carry it around. If it is small enough, it can be stored in your boat or camper where there is limited space. Cordless is the way to go when it comes to having a vacuum that can be used to clean up alternative spaces like a car or camper. Most times you need to clean up there is no socket available. Having a cordless vacuum gives you options. These are some things to consider when you are evaluating your needs for a lightweight vacuum. Of course, not every cleaning scenario is covered here. This buying guide for lightweight vacuums should be a good start to get you in the right direction, however. What are the criteria for an upright vacuum to be considered lightweight? In my opinion, it should be 5 kg or under which is more uncommon than you might think which is why I like this one. 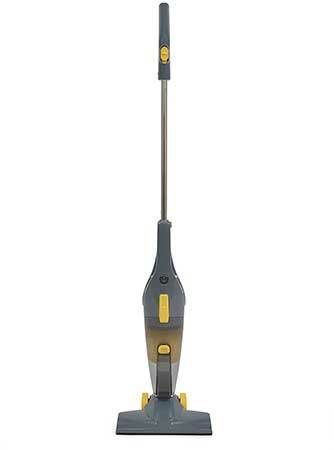 The Vax Air Stretch is a great, powerful vacuum that is great for carpet, hard flooring and pet hair. And at 4.9 kg it falls right within my own arbitrary parameters! Not only does it feature multi-cyclonic technology to handle large and fine dust, but it comes with a turbo brush attachment with a hose. That helps get the furniture, pet beds and anywhere else you wouldn’t reach with a traditional upright vacuum. It is very agile with a swivel base to get around the tightest areas. It’s lightweight enough to carry onto the stairs if you wish, however, the extendable hose means you can leave it on the floor and clean the stairs without lifting it. This also helps cleaning areas over your head like the drapes or cobwebs in the corners. The downside is that it is corded. Many people like rechargeable lightweight vacuums for the added convenience of being cordless. With a 13 metre long cord, finding a socket is not usually an issue, though. It’s a smart looking machine that is money well spent. At the same cost as a heavy upright or clunky cylinder vacuum, you get much more convenience for a much lower price with this lightweight economical vacuum. 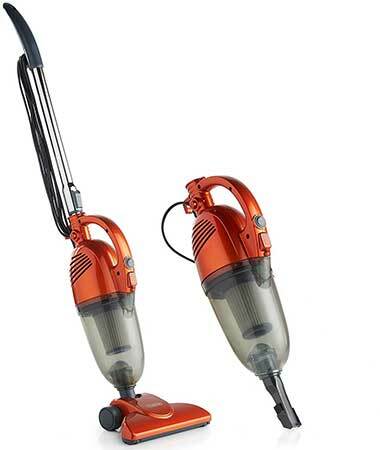 The most popular lightweight vacuum for sale on Amazon.co.uk is the Vonhaus 2 in 1 model vacuum. The price is right and you get a wonderful little vacuum with convenient features. If you read through the must-have list for lightweight vacuums, then you may notice that this model ticks a lot of those boxes. This makes it a good all-around vacuum for just about anybody’s needs. It converts easily into a handheld portable vacuum. It still retains all the advantages of an upright stick vacuum just in a smaller package. The tube is removed to make it small and easy to carry around, so the body does not change at all. You lose none of the suction power at all. With a 600-watt motor, the suction is very powerful. Again, this also holds true when it is in handheld mode. This makes it very good for pet hair even though it doesn’t have a rotating brush. And it also does really well on deep pile rugs since it doesn’t have the brush. The 1.3-litre canister is quite large for a lightweight stick vacuum. If you have pets or lots of carpets you won’t be emptying the bin too often. It has a nice crevice attachment with a hideaway brush. Tuck the brush away for use in the crevices of your sofa, but flip it back out to get the floor of your car. With the kind of versatility you get from this handy lightweight vacuum, the price tag is quite shockingly low. Buy two and keep one for the home and one for everything else that needs tidying up! Whether you have pets, children or simply a house that requires a lot of upkeep, you need a great vacuum. Not just the best lightweight cordless vacuum, but one that is going to deliver the goods. This cordless Shark DuoClean certainly delivers. 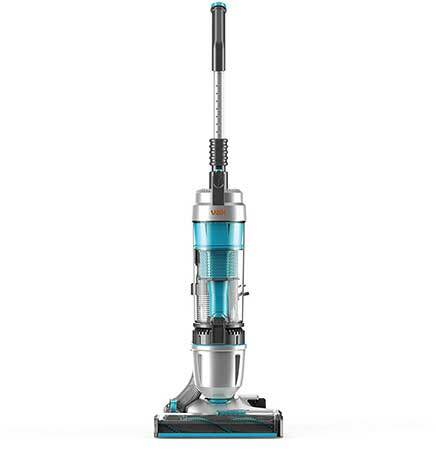 It’s an excellent vacuum in its own right, made even better by the fact that it weighs in at a paltry 4 kg and a 44 minute run time thanks to 2 lithium ion batteries. The DuoClean technology is a double roller system that beats up deep debris and funnels all the dirt right into the nozzle. It works wonderfully against pet hair and deep down debris in your carpets. Even if you don’t have pets or kids, if your floors are in need of a good cleaning then this is a highly efficient way to get it done. Whether you are dealing with high pile carpets or hard floors. The flexible wands help get under furniture and it’s so lightweight that it is easy to navigate tight corners or around obstacles. It converts into a handy little handheld vacuum with all the same power as it has in full vacuum mode. This makes it ideal for use in the car or stairs. Or for quick spot cleans in a pinch. Since it folds in half it has a very small profile and can be stored just about anywhere. It isn’t the quietest cordless vacuum on the market. I suppose it is designed that way to let you know it’s working hard with you to get your home cleaned! I’ve also got more Cordless Vacuum reviews for those interested. A vacuum designed to help the elderly can’t just be lightweight, it has to be easy to use. I recommend a cordless variety since dealing with a cord can be a hassle. And dangerous. Bending over is not an option for many elderly users. Luckily the Morphy Richards Supervac has a flexible feature that folds the unit to get under furniture. With the touch of a button, it goes to a 90-degree angle to slide right under the furniture. That makes it convenient, but it is also a very good vacuum with some nice powerful features. A 32V battery is one of the strongest I have seen when dealing with cordless vacuums. 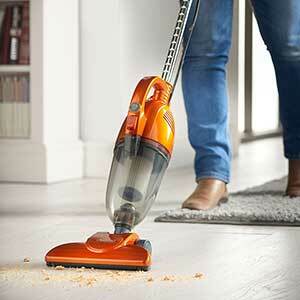 With a 60 minute run time and 2 different power modes, you won’t need to rush to finish the hoovering. Elderly have trouble moving quickly, so it gives a lot of peace of mind to know that they can vacuum at their own pace. It can be converted into a slim stick vacuum to get above head areas as well as a handheld mini vacuum for hoovering up counters or sofas. Stairs can easily be cleaned without needing to lift a heavy vacuum with you. A battery indicator light is a nice extra feature. In all, I would say this lightweight vacuum is ideal for the elderly with all the functions that make it so easy for them to use. Good things come in small packages, as well as cheap! You may have never heard of this Lloytron lightweight vacuum, but if you are on a budget, you will certainly appreciate it. For a low price you get a handy 2 in 1 convertible vacuum that can handle most of your average cleaning needs. It works well as an upright with a 600 watt motor for good suction. That power comes at the expense of having a cord, however. If you don’t mind using a corded variety then you are rewarded by good suction, at least. The handheld version has a crevice tool to get into the nooks and crannies of your furniture or stairs. A nice bonus is to have a good HEPA filter on such a budget-friendly vacuum. Allergy sufferers don’t have to struggle through a clean up with dust making its way back into the air just for the sake of saving some money. It’s also nice and quiet. Much more quiet than other vacuums with the same size motor. There isn’t too much else to really say about this cheap vacuum. If you aren’t expecting Dyson quality engineering and just want an economical way to keep your house tidy then I would say this fits the bill.